When the congregation of Sedgefield Baptist Church agreed that it was a fight worth fighting to take on the N.C. Department of Transportation, they realized that it would behoove them to hire an attorney who specialized in eminent domain cases such as theirs. They turned to Raleigh attorney George B. Autry Jr., of the firm Cranfill Sumner & Hartzog. Autry has handled several high-profile disputes between property owners and either the state or land developers across North Carolina. The dispute brought about by the High Point Road widening project is set to go to mediation Sept. 12, and Autry believes his client has a strong case. The DOT offer of just over $950,000 for the five-acre parcel of land and the two structures totaling 10,000 square feet, he claims, is grossly unfair for two reasons. Autry will argue before mediator Thomas Duncan that churches fall under a “special use” category of properties in terms of both depreciation and fair market value. Autry said that he has had a structural engineer estimate the physical deterioration of the 36-year-old church and found it minimal. The attorney also said that the conventional definition of “fair market value” does not apply in this instance. “‘Fair market value’ is what a willing buyer and a willing seller would take,” he said, “and we don’t have that here because churches are not bought and sold on the open market. So the question should be what is a fair reproduction cost. What matters to a congregation is a place they can go back to and call home. So basically the question is what would it take to replace what they lost through no fault of their own. In addition to Sedgefield Baptist, Autry is representing around a dozen other property owners along the path of the Jamestown bypass/High Point Road widening project. Roughly 160 parcels of land will be affected by the $41 million, 4.381-mile project. • Obtained a settlement of $5,380,00 for a Wake County property owner originally offered $2,700,000 for the taking of approximately 22 acres of land. • Obtained $11,900,000 for a Wake County property owner whose Raleigh property was acquired by the city in order to consolidate city services, including maintenance and parks and recreation. 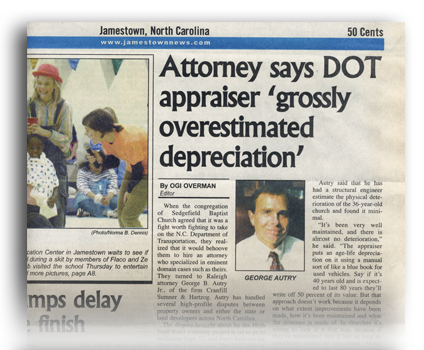 • Obtained a jury verdict of $2,691,703.94 for a Johnston County property owner originally offered $420,000. • Obtained a jury verdict of $2,533,364 including interest, for a Durham County hotel owner originally offered $291,000 for the taking of approximately .6 acres of land. • Obtained a jury verdict of $2,558,031.12, including interest, for an Alamance County landowner originally offered $400,800 for a partial taking of his property. The verdict continues to be the largest of any kind in Alamance County history. While not discussing specific dollar figures of this case, Autry did say that the “over $2 million” figure Mentioned by Sedgefield Baptist minister, Rev. Deryl Holliday, in a previous interview with the Jamestown News, was accurate.